From small fender benders to major car crashes, Virginia sees its fair share of automotive accidents. Whenever such an accident involves harm or damage, any drivers involved have certain reporting requirements under Virginia law. Drivers must adhere strictly to these requirements. Otherwise, they could face criminal fines and even time behind bars. What are the Reporting Requirements for Virginia Auto Accidents? The owner of property damaged in the accident. In certain cases, a driver sustains physical injury in the automotive accident and becomes temporarily incapable of submitting a report. As soon as the driver is capable of doing so, they must submit the required information above to police or law enforcement. Additionally, the driver must make a reasonable effort to locate any people harmed or property damaged as a result of the accident. What are the Virginia Penalties for Failing to Report an Accident? If any person violates Section 46.2-894 by failing to report an automotive accident, there is the possibility of serious criminal charges. Though the exact extent of those charges can vary based on the accident in question. Physical Injury or Death — Failure to report an accident that results in physical injury or death is a Class 5 felony. Upon conviction, the offender faces up to 10 years in prison and $2,500 in criminal fines. Property Damage Over $1,000 — Failure to report an accident that results in at least $1,000 in property damage is a Class 5 felony. Upon conviction, the offender faces the same penalties detailed previously. Property Damage Under $1,000 — Failure to report an accident that results in $1,000 or less in property damage is a Class 1 misdemeanor. Upon conviction, the offender faces 12 months in county jail and $2,500 in criminal fines. If you have legal questions about the reporting requirements for an automotive accident in Virginia, it is beneficial to reach out to a proficient criminal defense attorney. 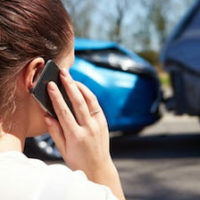 The attorneys at Simms Showers LLP, servicing Leesburg, Winchester, Fairfax, and Manassas, have proven abilities in the arena of criminal defense, including reporting requirements after automotive accidents. If you need legal help with criminal defense, contact us today for a free initial consultation.